The following will be familiar to unit holders who have been with us for a while but it is worth reiterating, nevertheless. Unit holders are the ultimate owners of the fund. We (meaning the promoters, management, staff, directors of PPFAS) are co-investors in the fund and as a result our interests are aligned. The promoter / management quality is great. The business is good in terms of return on capital metrics across a cycle, which is preferably asset light, which does not require too much of leverage (with the exception of financial stocks), which is understandable and at least to some extent has some competitive advantage. Finally, the valuation is reasonable or at a discount to intrinsic value. We are market-capitalisation agnostic, and can therefore invest in companies across the market cap. spectrum. We are also sector agnostic. However we eliminate sectors / companies which do not meet our criteria as listed above and we can invest in overseas stocks as well to the extent of 35% of the portfolio. We at PPFAS run a limited number of schemes. Currently we have only one equity scheme, Parag Parikh Long Term Equity Fund with the abovementioned investing approach. Our aim is not to have a cluttered or 'flavour of the month' kind of offering. In addition to the single equity scheme, we have a liquid fund to meet cash management needs. The objective here is to manage liquidity and not generate the 'highest returns'. Given this stance, the bulk of investments in the liquid fund are in overnight money in CBLO or in Treasury Bills. Going forward, our plan is to introduce an Equity Linked Savings Scheme (Tax saving scheme) probably in the next financial year. We recommend investors in the Equity Scheme to have a minimum investment horizon of 5 years. Why do we do that? To answer this, let us look at the following data. In the last 20 financial years (March 31, 1998 to March 31, 2018) the Nifty 50 Index has given a return of 11.65% p.a. on an average. However, good luck to anyone wanting a similar return over any one year period! Given below are the one year returns on Nifty over the last 20 years. The interesting point is that only in 4 financial years out of 20 namely 2017-18, 2010-11, 2006-07, 2004-05 have returns been anywhere close to the average returns. In all other cases, the returns have been all over the place. In fact in 7 of the 20 years, returns have been negative. An investment horizon of 5 years is not a silver bullet or a magic potion curing all ailments. However an investment horizon of 5 years reduces the chances of negative returns and even the magnitude of negative returns. In the case of rolling 5 year returns over the last 25 financial years, the number of negative periods fall to 2 out of 20 and even in those two periods, the maximum negative is 2.62% per annum as compared to negative 36% annual return as seen in the above table. Howard Marks' latest book “Mastering the Market Cycles” is an excellent read on the cyclical nature of investments. Charlie Munger has said that the secret to happiness in life is to have low expectations. The simple point I am making is that NIFTY 50 has given a price return of about 11.65% and even adding say 1.5% for dividends the returns are in the vicinity of 13%. I see many equity investors assuming returns of 15% to 20%. While there is nothing wrong in working hard and researching thoroughly and aspiring for higher returns, assuming that the market owes us those high returns because we are smart or hard working is fraught with risks. It is better to have low expectations and then beat them rather than assume high returns and find that our savings are not sufficiently large enough to meet our financial goals. Is the fastest mode of transport to your destination always the best? In our view not necessarily. Say, you are flying from Chennai to Delhi. On the normal path there is some weather turbulence and your pilot decides to take a detour on account of safety and comfort considerations. Due to this, you reach your destination 30 minutes later than the scheduled time. Some other pilot of another airline decides not to take a detour and reaches safely and on time but with a lot of scary moments for the passengers. Is the second pilot better? Say one is driving from Mumbai to Pune. The speed limit on the expressway is 80 kmph. One cab driver honours the speed limit and reaches the destination in proper time. Another driver drives at 150 kmph and reaches early without an accident. Is the second driver better? Many a times in our day to day lives, we choose a slower path on account of various reasons. Many people choose cruise ships or road trips or train journeys vs. air travel to enjoy the journey rather than just reach some place. Again for a long haul, air travel may be the best route. Investments are just the same. What matters is an enjoyable journey (less volatility), safe journey (avoid permanent loss of capital), the right destination (does the investment help you meet your financial goals) and reasonable speed (returns). Focussing only on one parameter of returns is not the optimal course. Watch Anthony Deden's interview on YouTube (two and half hours) for an excellent perspective on the topic of destination vs speed, permanent / irreplaceable capital and other topics). Which market will do well? Indian or overseas? We keep getting asked this question. We do not look at it that way. Our investments overseas are to get a wider opportunity set as well as to potentially lower volatility. Nothing more nothing less. It is not that we are bullish / bearing on India vs. overseas stocks. What is our exposure to currency movements? Bulk of our exposure to currency (80%-90%) is hedged using Dollar Rupee futures contracts. Hence we do not benefit or lose too much on account of Dollar Rupee movement on a day to day basis. Why hedge the currency when Rupee usually depreciates? When we hedge the currency risk, we get paid to do so! Typically the Rupee trades at a discount in the futures market and hence the benefit we would get from Rupee depreciation in a lumpy manner comes to us on account of the futures discount in a somewhat steady manner. As of the date of writing this letter, the future discount / hedging income is about 4% p.a. Is being in cash equivalent to 'market timing'? We are all for being fully invested in equities provided one is convinced of the opportunities on hand. However sometimes it so happens that nothing on offer seems compelling and in such cases we would rather be in cash or arbitrage positions waiting for opportunities to come by. We are not predicting election outcomes, interest rates, trade wars (or lack thereof), oil prices, geopolitics and so on. We just want an attractive bottom up stock pick to deploy cash and if one is not available, we stay in cash. Some people call this market timing. Regardless of the label, this is what we do. This is painful in runaway bull markets (like in 2017) and looks good in 2018 kind of scenario. We are excited by the possibility of full deployment in the coming days and months given that there has been a significant fall in some stocks in the past few months. Does it mean that everything is attractively priced? Surely not. In fact stocks in our favourite hunting ground – the FMCG space and consumption related stocks are at still valued at a significant premium compared to their past. A question repeatedly asked is our view on FAANG stocks (Facebook, Apple, Amazon, Netflix and Google – now Alphabet). This is given the fact that we own Alphabet and Facebook and in the past have owned Apple. Our investments in these companies has nothing to do with the popularity or otherwise of the acronym or any theme. It is just that on a bottom up basis, these companies looked attractive investment opportunities. In fact we do not understand how to value Netflix and Amazon and currently may be erring on the side of caution by not buying Amazon. (A few friends in the technology space and who are great investors in their own right and who I respect a lot have been drilling into me that Amazon is a bargain. They have make some points which were new to me and I have conceded that some points they make are very valid. We have however not yet given in, and consequently, have not yet invested in Amazon). Given the shift towards digital advertising and media consumption and the large addressable market for Alphabet and Facebook we continue to remain invested there. Privacy concerns and Anti-Trust regulations are risks to both Alphabet and Facebook. However any strong business will eventually face public scrutiny and attention from regulators and media. We will monitor these risks. Is there a bubble in Tech. stocks? Probably there is. Given the large outperformance of technology related stocks, there are surely many bubbles out there. The startup space is increasingly looking like we have gone back to the dot com boom era. However the larger companies like Apple, Alphabet, Microsoft and Facebook have real sales and are cash generating machines and are not looking like they are in a bubble. The bubble in my view is in the startup / unlisted unicorn space and in some futuristic concept stocks rather than in somewhat mature technology companies. What is common between the tobacco business, alcohol business and the banking business in India? All of them require licences to operate (which are hard to come by). Given that about 2/3 of the banking sector is with the government run banks and that they are going through their own turmoil, well run private sector banks have a good runway in a growing economy where they participate not just in secular growth but also gain market share. The bulk of our investment is in HDFC Bank and with smaller investments in Axis and ICICI. While there have been governance concerns in the latter, they are also under continuous public scrutiny. We think that the retail franchise of these banks is intact and that their woes on the corporate lending side should be resolved in the coming years. In a rising interest rate environment and an environment where NBFCs are viewed with suspicion, CASA (current account / savings account) rich banks with low cost of deposits will have a structural advantage going forward. There are many IT and pharma companies with good governance and good businesses. However both sectors have been facing headwinds in the past. IT companies have been facing a rock steady currency (which has changed with the Rupee depreciation of late) and increased automation and shift to newer technologies. However the need for investment in IT and the need for service providers to execute the plans will remain. We are invested in a few IT Services companies that we like. Pharma companies again have been facing headwinds of pricing pressures, quality issues at the plant level and currency. Most of these headwinds are getting resolved. In Pharma, given that company level and product level uncertainties are high, we have been investing smaller percentages in individual companies and have a basket of well run companies rather than taking big positions in individual companies. There are many well run companies in this space but valuations here have been priced to perfection. On account of this, the weightage in this space for Indian stocks has been low for some time. Of course we own some global stocks and a couple of Indian stocks here. Given the low penetration in India and the market dominance of some players in the 4 wheeler and two wheeler space, we have a few investments here. We are cognisant of the rapid changes happening on account of ride hailing / sharing, electrification, autonomy and will monitor developments and their impact on our investments. What will markets do in the coming months? No one knows. At best we can attempt to look at where valuations are. Given the steep fall in some stocks, it is becoming an interesting time to start investing fresh money. As always there will be pockets of undervaluation and pockets of overvaluation. The one caveat the I have while looking at valuations is that we have been so used to falling / low interest rates and ample liquidity for a long time that the valuations seen in the recent past may not be representative of more normal valuations and may be an aberration. It will be unwise to get anchored to those and to guard against the contract effect. Our entire team and I look forward to interacting with you at our forthcoming annual unit holders' meetings in person or via the online streaming interaction. Thank you for investing along with us. Note: Readers should note that objective of this letter to the unit holders is to communicate with our investors, distributors and share with them our thought process. It should be noted that views expressed here are based on information available in public domain at this moment. Views expressed here can change depending on change in circumstances. Nothing discussed here, constitute a buy/Sell or hold recommendation. 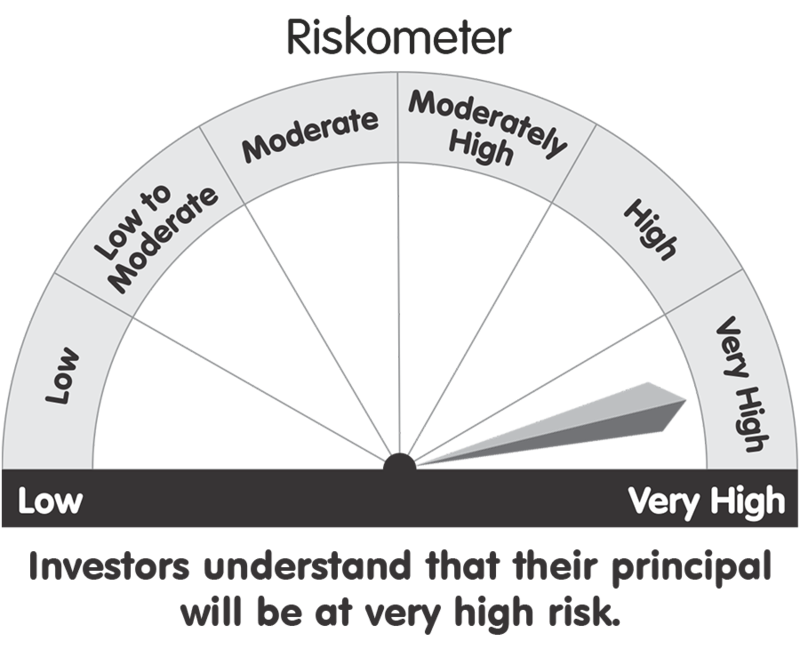 will be at moderately high risk.